Facebook Ad Metrics are finally getting simpler. Facebook is rolling out new metrics and removing a litany of redundant and useless metrics from the Ads Manager. The Facebook Ads Manager is messy. Too many metrics makes reading ad data a pain. Thankfully, Facebook’s been listening. Facebook is removing redundant metrics, and adding metrics to help businesses and brands succeed. You will notice that some of these metrics are labeled as “estimated’ or in “development” in the ads manager. Facebook is adding the label “estimated” to be more transparent about their reporting methodology. Facebook measures ad performance by scaling samples in order to provide real-time results. When this method is used, Facebook will label the metric as estimated. Labels that are still in BETA will be labeled very obviously as “development,” indicating that they may change throughout this stage. 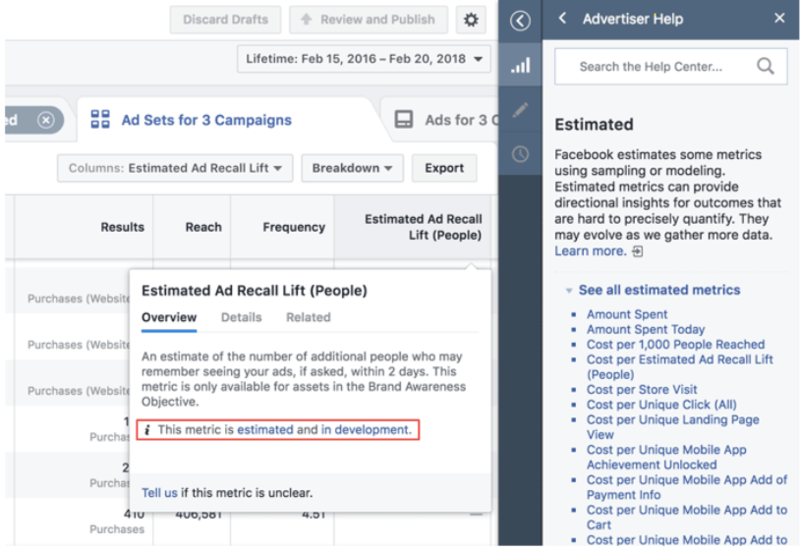 A great example is the new “Ad Recall Lift” metric Facebook is rolling out. Since this metric works by polling a sample of the advertising audience, it is labeled as estimated. Given that it’s a new metric in BETA, it will also be labeled development. Over 20 Ad Metrics on the Chopping Block! Bam, big changes are coming. Actions, people taking actions, cost per action. Actions as a metric is a sum of various actions users have taken on your ad. Since there are many different possible actions a user can take, this metric is not granular enough to derive business results. This is a redundant metric. If you want to see the amount your ads spent today, simply adjust the date range to today and use the Amount Spent metric. This is another redundant metric. Link Clicks, Event responses, and saved for later are all metrics tracked for your ads. This metric provided clicks and conversions for Carousel ads. Its redundant – you can already get clicks and conversions data from the ads manager. This is another redundant metric. You can use Mobile App Purchases Conversion Value instead. Positive and Negative feedback as metric outputs are not insightful on their own. These signals are used as inputs for the Relevance Score metric which paints a clearer picture for understanding how well an audience is responding to ads. Who even uses this? …Exactly why this metric is a goner. Use the other Canvas metrics for view times. This is an outdated metric for your brand. Page mentions can’t tell if you’re receiving positive or negative feedback. If you care about following, use the page likes or page engagement metrics instead. A social ad is supplemented with copy that’s familiar to all of us “3 friends liked this page.” However, advertisers don’t have control over when this sort of social ad is delivered. Since these metrics are not actionable for advertisers, Facebook is doing away with them. Instead, leverage traditional reach, impressions, and clicks for ad performance. This metric tells you how many views your Facebook page tabs received as a result of an ad. This metric is relatively useless. Page likes and page engagement are better indicators for Facebook page success. This metric was built to help advertisers understand which clicks lead people off Facebook through an app’s deep link or to an app store or other backup link destinations. Due to new mobile operating system updates, this metric is being revisited. In the meantime, advertisers can use outbound links as a metric. This is an interesting metric for physical retail and office locations. You can run Facebook ads that are built to drive store visits using a store locator. This will be one of Facebook’s most powerful metrics if its rolled out right. This gives brands the ability to measure the recall-performance of their ads. We’ll keep you posted as more metrics come out. Elias is obsessed with all things tech. After a long day he enjoys cracking an ad account open and running optimization tests like an evil scientist.